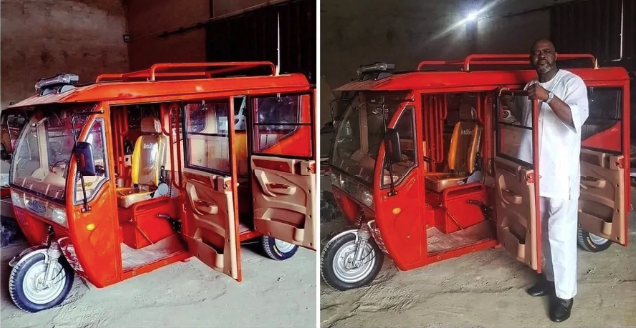 Amazing Photos Of New Keke Napep Reportedly Made In Nigeria – Have you ever entered a keke napep on a rainy day and still get drenched with water? Rainy days don’t stop people from trying to make a living, most people just take a leap of faith hoping they don’t get soaked. Nigerians going to work on a rainy day rush into vehicles and tricycles to avoid getting drenched with water, however, tricycles have no doors and passengers end up getting soaked before getting to their destination. Some keke napep drivers fix shades at the sides of their tricycles to prevent passengers but it is never enough. With the help of innovative Nigerians, passengers who fall victim to tricycle problems such as getting soaked can be rest assured that help is on the way. Photos of newly invented keke napeps have surfaced online. It was gathered that these keke napeps were reportedly made in Nigeria. These new tricycles can be considered as luxury tricycles since they have everything the ones we are used don’t have. According to Facebook user Raphael E. Junor, the keke napep can take three to six passengers at a time. It has electric fan and good ventilation. And most important of all, it comes with doors that fit both sides and an extra tyre at the back just like SUVs. 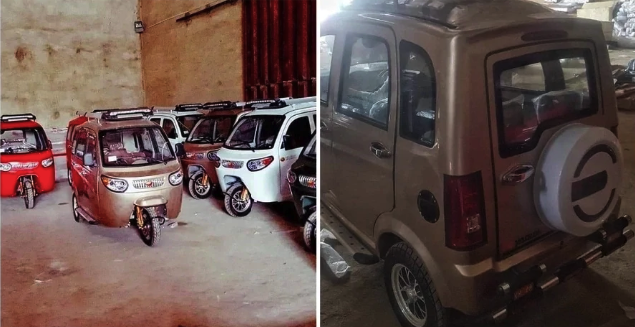 0 Response to "Amazing Photos Of New Tricycles (Keke Napep) Reportedly Made In Nigeria"